Before we talk specifically about the Moon in Gemini, let’s talk about the Moon for a moment. Astrologers consider the Moon a planet, and it’s the fastest moving of all of them. Because it moves so quickly, the Moon passes through each of the 12 zodiac signs once every month. Just as the Sun has a placement in our birth chart, so does the Moon. 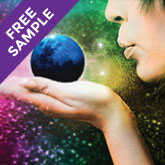 You can use our FREE Astrology report to reveal what your lunar sign (also called natal moon sign) is. Knowing this will help learn about things like your moon sign traits, moon sign compatibility, and more. The Moon is always moving which means that even if you were born with the Moon in another sign, we are all honorary Geminis once a month. 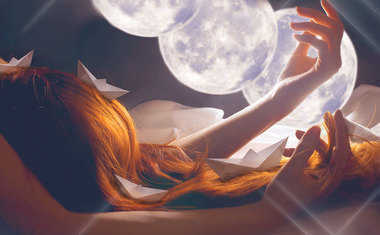 When the Moon is moving through Gemini, regardless of how we normally feel, we may be a little bit more scattered during this time. Astrologers would categorize the Gemini Moon personality as easily distracted -- it’s hard to focus when there’s always something else that could use our attention. Every separate event seems like the most significant one, yet each one takes its turn in the spotlight and then quickly fades away. Take advantage of the Gemini Moon’s mutable atmosphere by changing your mind about something, or seeing another side of an issue you’ve been stuck on. 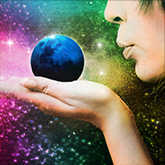 The New Moon is always a cosmic turning point when we say goodbye to one cycle and hello to the next one. 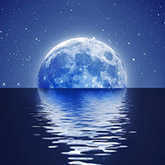 At the end of every spring, around May, the Sun and the Moon will both be in the sign of Gemini, making it a New Moon. This is the time to plant those metaphoric seeds. The New Moon in Gemini wants us to plant a specific type of seed -- a thought or an idea -- and it’s perfectly fine with not knowing how these plans will unfold. Geminis can feel restless with plans that are too concrete, and have trouble following through. This makes it an ideal time to start something new that will allow you room to explore as it takes shape. Six months later, at the end of autumn, the Sun will be in Sagittarius while the Moon is in Gemini. Because the Sun and the Moon are opposite of each other, we have a Full Moon. 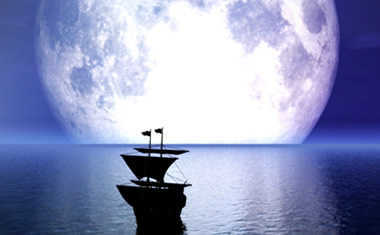 This is the time when we see the seeds we planted during the New Moon come to fruition. 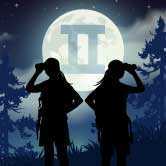 The jittery Gemini Full Moon is easily distracted by a million minor details, which is a contrast to the philosophical perspective of the Sagittarius Sun. Sagittarius is not easily distracted, and loves a big idea or a big project. Because we’ll have the influence of long-term loving Sagittarius, the Full Moon in Gemini is a great time to roll up our sleeves and put energy into a project. This could be undergoing a personal transformation, or acting on an idea that we’ve been considering for awhile. Regardless of your sun sign, if your Moon is in Gemini then you feel like one. Gemini is an Air sign, and Air signs are about movement. They’re like a kite on a windy day -- they love to let their thoughts soar, spin, and roam. A Gemini’s curiosity is always stirring, and they find stories about people or the world endlessly fascinating. There’s a sense of always needing to know more, and to gather facts. They’re the person at the party who will introduce themselves to everyone, and get to know as much about each person as possible. People born under the Gemini Moon are clever and love to be around people who can teach them more about the world. You’ll often find this intelligent sign reading a book, watching the news, or taking a class. "The more information the better" should be the motto of this sign. Because they’re highly adaptable, Geminis don’t enjoy routine -- they thrive on change and adventure. The airiness of a Gemini is on full display as they float from one thing to the next. There’s never a dull moment when a Gemini is around! Geminis are charming and flirtatious which make them highly desirable. A Gemini in love is a wonderful thing as they’re loyal and trustworthy partners once they’ve found someone they want to settle down with. You can look at your Moon sign compatibility to discover which signs are your best astrological matches. Find out how your Moon sign impacts your relationships in this free sample of the Personal Moon Astrology Report. This unique Astrology birth chart delves deep into your psyche, with insights that lend clarity and depth to your self-knowledge. This report illuminates the Moon’s influence in your Astrology birth chart, revealing your needs, emotions and style of relating.